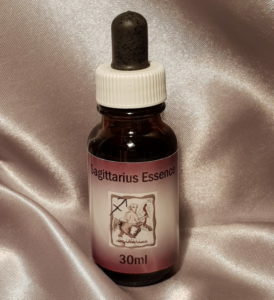 Sagittarius Essence is the ninth in our Star Sign Range. Also the ninth sign of the zodiac Sagittarius the Archer (23rd November – 21st December) represented by a flying arrow symbolises the quest that drives this sign; the centaur suggests a dual nature that fuses instinct with intellect. Sagittarius is the sign of human adventure, playing and gambling, search for fulfillment, love of life and naïve optimism. Sagittarians are sometimes taken in by their own or others’ ideas, and lack of realism. Sagittarius has explored many belief systems during his or her lifelong quest for meaning. The karmic challenge is to distinguish what is truth and to live according to that.